For the last eight years, Chad Atkins has groomed stubble, tied a bandanna around his noggin and donned a kilt to become NotQuiteAxl, faux-banshee frontman for Guns N’ Roses tribute band Appetite for Destruction. 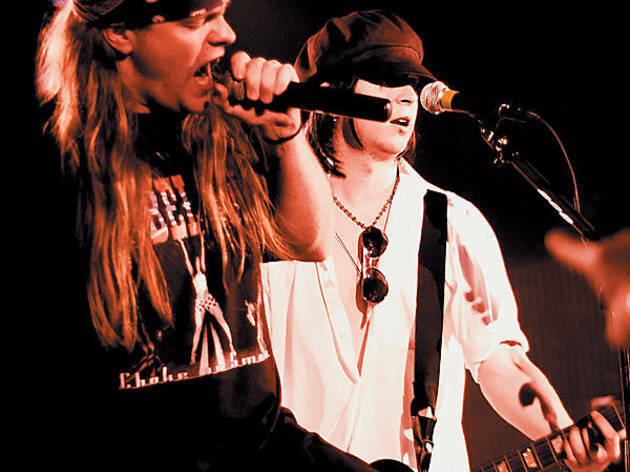 Considering Axl Rose’s public feuds with Dr Pepper, reluctance to tour and recently released 13-years-in-the-making epic Chinese Democracy, it’s a prime time to be in the business of ActualAxl mimicry. Then again, with no more Slash in the band (replaced by a guy with a fast-food container on his head) and arcane new tunes, things could get a lot more complicated. We chatted with Atkins before his Raleigh, North Carolina, apers coheadline a gig with AC/DC tribute Back in Black. Time Out Chicago: Let’s get NotQuiteAxl’s review of Chinese Democracy. Chad Atkins: When I first heard it, some of the songs went over my head. But now I really dig it. It seems thought out, and it rocks. 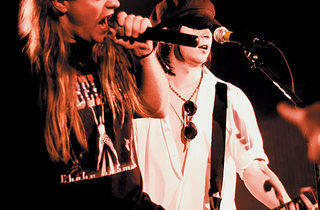 TOC: Axl uses a lot of bizarre voices on the new album. Sometimes he brings to mind the vampire puppet from the mock musical in Forgetting Sarah Marshall. Have you tried to perfect this? Chad Atkins: Not yet. There are some voices that aren’t standard Axl, but I’m not worried. TOC: Crazy Howard Hughes–like stories about Axl constantly emerge. Do you feel like you understand him better than most because you slip into his skin every night? Chad Atkins: To do this job you have to understand the persona a little bit, but I certainly would not say I have a connection. I was a kid that grew up on Guns N’ Roses—no weirdness. You come across some tribute acts that have tattoos of the band, that really live it. I’ve met Kiss guys like that, who go a little more over the edge. Back in Black, they’re not talking AC/DC one hundred percent of the day. It’s mostly just the Kiss bands. TOC: On your website, you compared anticipation for Chinese Democracy to awaiting the results of an AIDS test. Surely the uncertainty of this record changed the game for a self-proclaimed 1987–1993–era tribute band. Chad Atkins: If anything, the record helps us out because it sparks interest. But Guns N’ Roses’ success is based on its foundations. Any new stuff that comes out, I wish the best for them, but I don’t foresee it really changing what we’re doing. TOC: So you’re not going to introduce NotQuiteBuckethead? TOC: Awesome. Where’d you find a Buckethead? Chad Atkins: Kentucky Fried Chicken, man! Appetite for Destruction and Back in Black pay homage at House of Blues at 9pm on Thursday 8.